Welcome to another blog hop from The Alley Way Stamps. You should have arrived here from Lyndal's blog, but if not all the links are down the bottom of the post so make sure you check out all the DT creations. I used the new set called Trees Company, it has some amazing images, it's one of my favourite sets so far. Check out The Alley Way Stamps post for how you can win all three sets. Leave a comment here for a chance to win too! Love the little red bird!!! Cute!!! Great card!! I love the red bird on that green tree! Really just pops out at you!! Love that twine too! Fantastic work!! Love the CAS look of your card! The tree and birdie are so cute!! Love this! Simple but beautiful! I love the tree!! Super cute card!! love that red bird on the tree! perfect cas card! Adorable card Tracy, love the gloss on your little bird!! Cute card, love the little red bird!! This card is super. Love how the bright red bird stands out and the red bling adds just that bit of sparkle that I love on cards. Simply beautiful card. The red and green palette are so pretty! ADORABLE love the tree and little bird!!! Adorable! LOVING that little red bird, just too cute! This is cute and beautiful!!!!!!!!! What a cute and sweet card...the little red bird really stands out with the shine an the red twine and bling are a nice touch. Clean and simple perfection! I love the gloss on your little bird! So cute! Love the tree and the bird is so sweet! Cute! Fun stamping and great additional embellishing!! great card tracy. I love the little birdie! What a Smashing card!!! love the simplicity of it too!!! This card is so cute. Love the simplicity of the card. Wonderful card and I love the bird! That one tiny little sentiment is perfect! Love the added gems! Adorable fun card, love the cute bird!! Very fun simplicity! 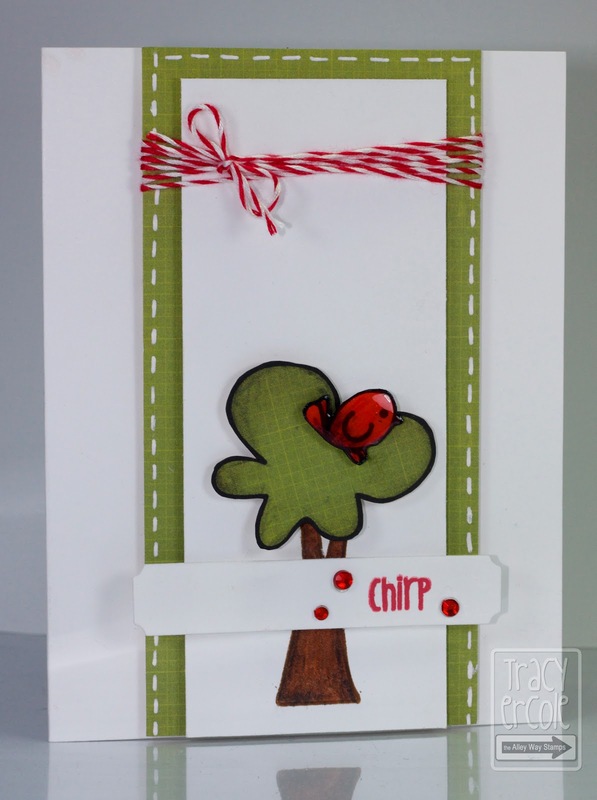 Great little "chirp"! this is so cute! Love the little stitching down the sides! Love your shiny red birdie! Great card! Love that little red bird. Is he dimensional? Love the pop of red and twines! So crisp and lovely, Tracey! so glad that you link up your blog to my MSS stamps giveaway! Really cute card. The bird is adorable!! Thanks for sharing. Adorable card! Love the pop of red! Thanks for joining us for the Simon Says Stamp Challenge! Love the gloss on that red bird for an extra pop! Thanks for a chance to win! The twine adds the perfect finishing touch! Love the color combo...the twine is perfect...and that birdie is to die for!